Conventional and unconventional technologies for processing and coating cold rolled steel strips. Intelligent systems for controlling and rendering the processes efficient. Conventional and non-conventional techniques of designing process adjustment algorithms. Methods of digital adjustment of industrial process parameters. Applications of the research studies at GALFINBAND S.A.
Tin tin-lead alloy and zinc coating technologies for thin steel strips. Technology for manufacturing the anticorrosively protected steel strips. Specific methods and algorithms for the computer assisted control of the narrow and thin steel strips rolling. Computer assisted control of the heat treatment in bell type furnaces. Automatic system for three axis positioning with remote I/O sensors. Coiled or continuous steel strip blueing technology. Modern system for straining the shelps on longitudinally slitting lines. Lacquer coating technology for steel strips on continuous manufacture line. Electrostatic spraying painting technology for steel strips on continuous manufacture line. Information processing system for the real-time guidance of the cooling process of the hot rolled steel strips - ROMSYS UNIVERSITY of Galati. 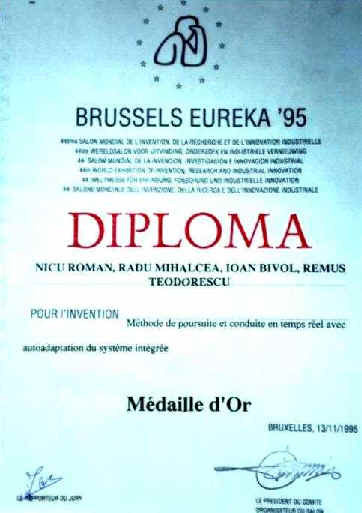 Methods of numeric adjustment of the strips thickness with the optimization of parameters and constant values specific to the cold rolling process - Brussels EUREKA '95. (gold medal). Automation system for the guidance of cold rolled steel strips with the integration of the manufacturing processes of cold rolling, thermal treatment, adjusting - Steel Strip'96 Opava Czech Republic.